Among Southern Baptists no name commands more respect than Charlotte Digges "Lottie" Moon. Her self-sacrificing spirit, gritty determination, and commitment to bring Christianity to China have been legendary within denominational ranks for well over a century. Indeed, many know of her work, but few know of her life. 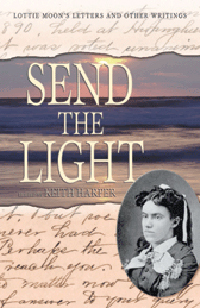 Send the Light: Letters from Lottie Moon is a collection of letters written by the most beloved of all Southern Baptist missionaries. These letters offer a rare glimpse into the daily routine of a woman who challenged nearly every missionary preconception that Baptists cherished at the turn of the century. She faced wars, anti-American animosity, and cultural alienation with a quiet dignity and faith that inspired her fellow missionaries and eventually won the hearts of her Chinese neighbors. She urged her denomination to support their missionary enterprises with the same type of zeal that motivated her. Moreover, Lottie Moon was never bashful about chiding, even scolding them when she thought they were not doing enough to support missions. Beyond her numerous admonitions to Southern Baptists in general and the Foreign Mission Board in particular, Moon's personal correspondence captures a sensitive, caring woman who loved children and valued education. Always one who maintained deep family roots, these letters offer an intimate look into her desire for her family members to live happy, productive lives. They also reveal a woman whose sober, common sense approach to life was tempered by a subtle, often unexpected, sense of humor. All told, Send the Light reintroduces the world to a devoted missionary who forever changed the way Southern Baptists viewed missionaries.